"Brothers and sisters drawn by their father’s death back home to the family farm, a friend wrestling with the ghastly consequences of his own inattention, a very-ill man’s pilgrimage to the high mountains of California—these spare and deeply western stories crackle with hard-earned grief, love, and, when it matters most, humor." 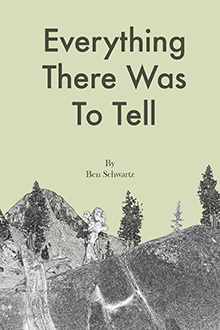 "This cleanly and powerfully written collection by Ben Schwartz puts one in mind of certain eminent writers of the West – Wallace Stegner, David Vann, and the Kerouac of Dharma Bums – forming, unlike many story collections, a unity of mood and theme, and putting on display some high-level literary chops. Mr. Schwartz feels strongly and the storms of emotion in his stories lead to deep skies."